When it comes to cookies, brownies, cakes, or pretty much any other type of dessert, I usually don’t “waste” my time unless there’s a decent amount of chocolate in the recipe. However, several weeks ago, Dave requested Snickerdoodle cookies. His mom almost always has a stash of these in the freezer, and I guess he was just craving them. So since I couldn’t remember the last time I made Snickerdoodles, I decided to make a big double batch for the freezer. 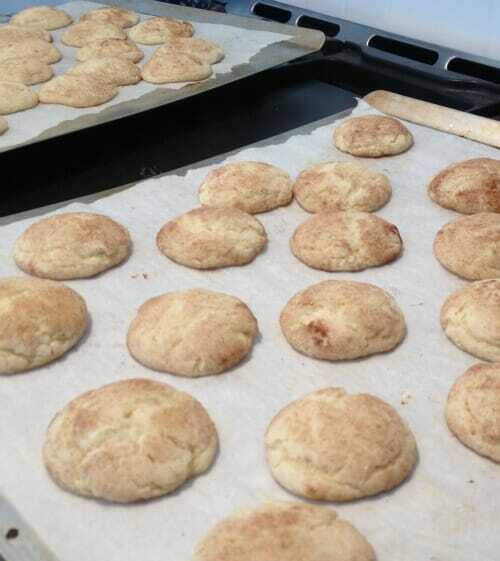 I asked around on Facebook for the BEST Snickerdoodle recipe… and you definitely did not disappoint. 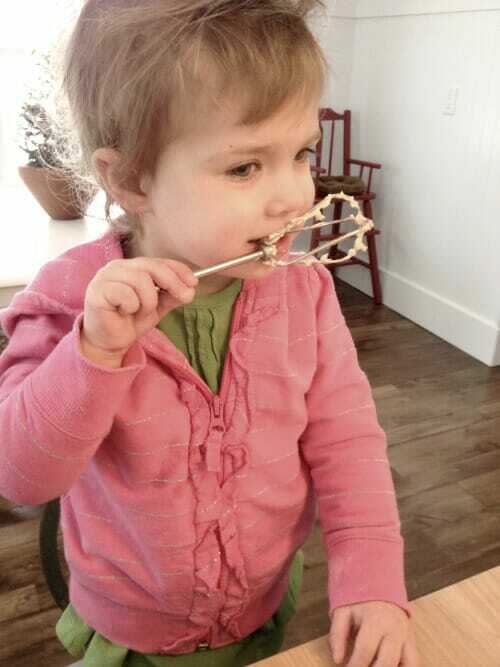 You shared so many awesome recipes — I didn’t even know where to start. I ended up choosing the Mrs. Sigg’s Snickerdoodles recipe from All Recipes.com — partially because it was recommended several times, and partially because it was almost exactly the same as Dave’s mom’s recipe. As I mixed up the dough, I was feeling less than confident about my recipe choice… but once the cookies came out of the oven and I took my first bite, I was hooked. I couldn’t wait for Dave to get home from school to try one… of course, he approved! Once the cookies came out of the oven, I let them cool for a few minutes before transferring them to cooling racks. These are the most delicious, crispy-on-the-outside, soft-and-chewy-on-the-inside, Snickerdoodle cookies… I’m sure you will not be disappointed. And yes, they freeze wonderfully. I’ve frozen the already baked cookies, the dough balls rolled in cinnamon sugar, and big tubs of just the dough — all with fabulous results! I’d been looking for info about freezing the raw dough and freezing the already-baked cookies, and found the info here! 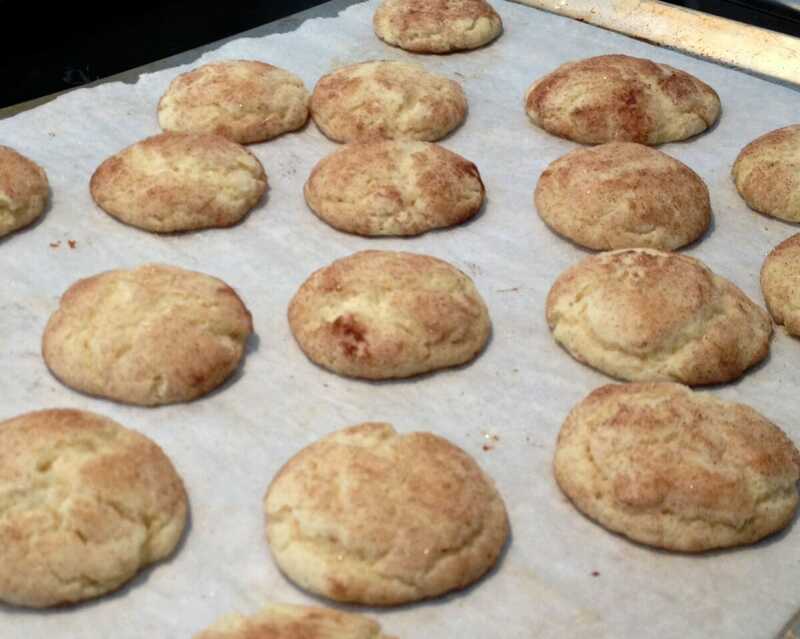 I already use this particular recipe — which is the best of all Snickerdoodle recipes, imho. Thank you! Andrea, I have frozen cookie dough balls before, but how do you do the tubs? If I make the cookie dough and put it in a container, do I then just thaw it and it won’t be too soft? Hmmm… I guess I just put the tub in the freezer and when I’m ready to make cookies, I let the dough defrost and scoop it out just as I would if it were “fresh”. I never really thought about it before — but there is definitely not a “right” or “wrong” way to do it. just free and defrost! I noticed in a lot of your recipes that are either butter or margarine you use Imperial !margarine so I want to know if that is what you use for this recipe? Also do you have a preference for plain or butter flavor shortening? Love all of your recipes! I honestly don’t have a “normal” brand or type of butter/margarine that I use — I almost always use what I have in the house (so I’ve most certainly used both butter and margarine for this recipe). I am in a pinch (napping 2 yr old and can’t get to the store). I need an easy dessert for tonight and have all these ing. except cream of tarter. Have you ever substituted the c.o.t. & baking soda with baking powder? Trying to figure out how to do so. I know this isn’t about the cookies (which look amazing by the way!) 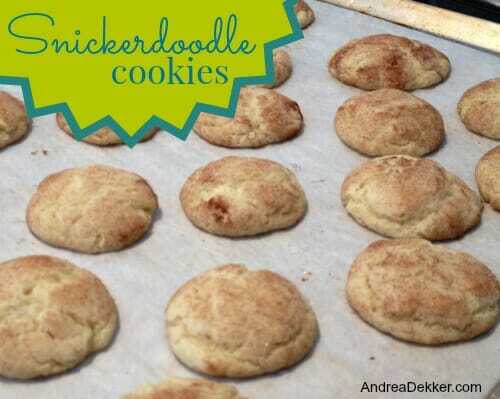 but how do you create the text image that says Snickerdoodle Cookies? I know you use Fotoflexer for photo editing but is it a separate program you use? Yes! This is almost exactly my mom’s recipe, although I don’t think mine calls for vanilla. I use all palm oil shortening to make them dairy free, and they are still delicious. I’ve also used all butter and of course those are good! When I make cookie dough for the freezer, this is one of my go-to recipes. Everyone I’ve given them to has loved them as well! I bake them straight from the freezer, adding maybe a minute to baking time. This will be a great recipe to make with my boys helping, they love these cookies! These sound great Andrea! I can’t wait to try them! Also, I just wanted to let you know that I really enjoy the recipes you post. They almost always are made from ingredients I already have on hand, they are very kid friendly and printing them off of the computer is a breeze. Thank you for being such a great source for new recipe’s! Thanks so much Barb! I appreciate your kind words and am SO glad you like my recipes. I’m definitely not a master chef, but “simple” and “practical” seem to strike a chord with so many of my readers who are looking to get food on the table quickly!